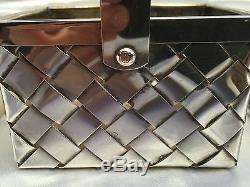 THIS IS A MAGNIFICENT 3 PIECE COLLECTION OF CARTIER STERLING SILVER HAND MADE BASKETS. THIS COLLECTION HAS A WONDERFUL DETAIL DESIGN AND WORKMANSHIP WITH NO INITIAL OR MONOGRAM. THE TWO SMALL BASKETS ARE SIGNED, BUT THE OTHER ONE IS NOT SIGNED. THIS SET WEIGHTS 7.95 OZ. THE LARGER BASKET WEIGHTS 4.5 OZ. 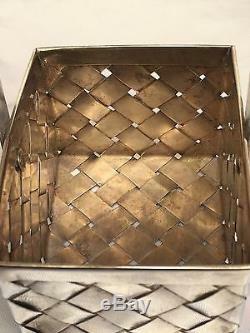 THE LARGE BASKET MEASURES 3.5 IN FRONT 3 IN WIDE 2.25 IN HIGH W/O HANDLE, AND WITH HANDLE MEASURES 4.4 IN. EACH SMALL BASKET MEASURES 2.5 IN FRONT 3.25 IN TALL(WITH HANDLE) AND 2.2 IN WIDE. YOU CAN REACH US AT 310 260 0026. IT IS OUR PLEASURE TO BE AT YOUR SERVICE. 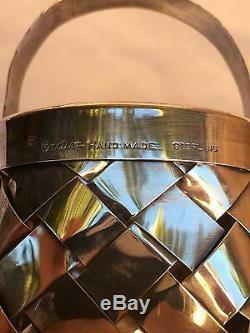 The item "MAGNIFICENT 3 PIECE CARTIER FRENCH HAND MADE STERLING SILVER BASKETS MUST SEE" is in sale since Friday, October 21, 2016. This item is in the category "Antiques\Silver\Sterling Silver (.925)\Other Antique Sterling Silver". The seller is "ambiancearts11" and is located in Beverly Hills, California. This item can be shipped worldwide.